For centuries Pearls were the lifeblood of the Gulf economy and Bahrain stood at its very center. Translated from Arabic the name 'Bahrain' means “two seas,” so named for the Arabian Gulf and the natural freshwater springs that feed it from the sea floor near this island nation. These uniquely rich, warm waters are prime habitat for oysters and many regard the pearls produced here as the finest in the world. The century from 1830 to 1930 was the apex of Bahrain’s pearl economy. During that period as many as 30,000 divers worked the oyster beds and some 35,000 tons of oysters were harvested each year. 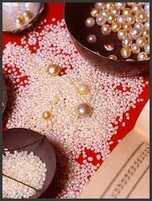 At that time Bahrain supplied 80-90% of the world’s natural pearls. The Great Depression smothered global demand while a wave of more affordable cultured pearls flooded the market to further soften prices. In 1932 Bahrain’s enormous oil reserves were discovered (Bahrain was in fact the first country in the Gulf, where oil was discovered) and pearl divers and others working the dhows and oyster beds rushed to participate in the oil boom. Water pollution from oil spills and overfishing took a heavy toll on the once pristine waters of the Gulf. The foresight of the ruling family realising the wealth generated from oil would not last forever and would have to be invested in sustainable industries, which led to the birth of a much diversified industry where Bahrain had a leading position in the Aluminium Industry, Oil & Gas. Bahrain has always put a strong emphasis on the education of its local population, which has resulting in leading local hospitals, schools, universities and a very strong banking and financial sector, which was well advanced in comparison with all neighbouring countries, resulting in Bahrain actually being the banking hub and centre in the GCC.